Purchase your own personalized brick to honor a loved one or to simply note your connection to our spiritual center. 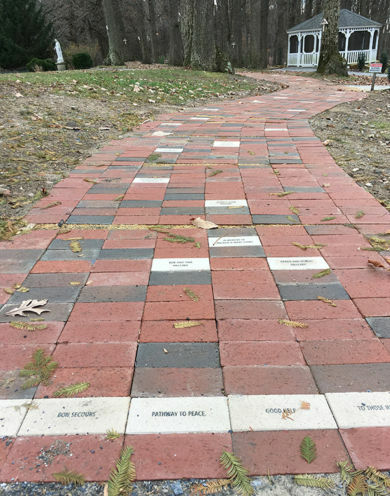 In celebration of the 50th anniversary of the Bon Secours Retreat and Conference Center in 2018, a “Pathway to Peace” was created – a brick walkway which extends from our walkway near the gazebo to the Peace Garden. This quiet pathway now carries our guests to one of the most peaceful places on our campus. The path ends at the front of our lovely Peace Garden where the Worldwide Peace Pole stands, a symbol calling all who encounter it to pray for peace around our world. The Pathway to Peace continues to serve as a fundraising campaign for the Sisters of Bon Secours in an effort to offset the operating expenses of the Center, a ministry of the Sisters of Bon Secours. have cherished our Center over the last 50 years. 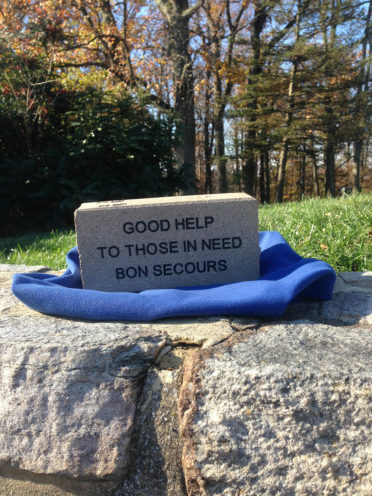 By purchasing a commemorative brick, you can contribute to the wonderful grounds of Bon Secours and be part of our continued legacy of “healing hospitality” as people journey to the Peace Garden. The purchase of these bricks will be 100% tax deductible. Please click on the link below to visit our secure brick ordering website. You will insert your engraving information directly on the website and submit your donation there. You may also pay by check. Thank you for considering this fundraising campaign and for taking a step on our Pathway to Peace.